Understand how mining works. If you are new to mining, read our Beginner's Guide. Make sure you understand that you will never make a profit out of CPU or GPU mining, and that ASIC hardware is required. Create a pool account. Register here. Mind that some software (notably some versions of the web interface of Antminers) requires you to omit the protocol prefix (stratum+tcp://) when entering URLs. If you want, you can create additional workers on your account page, with names and passwords of your choice. Both the username and the password are case-sensitive. Never use your account password for any of your workers. Create a Litecoin address. Download and install a Litecoin client from the official website. After starting Litecoin Core, click on the “Receive” tab and copy your Litecoin address, then paste it in your account settings so that you can receive payments. Alternatively, if you wish to use Electrum-LTC, you can use any of the addresses shown in the “Receive” or “Addresses” tab. Your Litecoin address should start with one of the prefixes “L”, “M”, or “ltc1”. The pool automatically serves work of optimal difficulty by estimating the speed of your miners and applying gradual adjustments to the share target. It may take a couple minutes for the difficulty to stabilize. Share difficulty changes do not influence your expected earnings. If desired, the default adaptive mechanism can be overridden by appending “,d=N” to the worker's password (in your miner's configuration, not on the website). Do not insert any whitespace or thousands separators. For example, if a worker's password is “foo”, connecting with password “foo,d=1024” will ask for share difficulty 1024. Keep in mind that difficulty can only be set on a per-connection basis, so if you connect multiple workers via a proxy they will all share the same difficulty (this is a limitation of the standard Stratum protocol). Moreover, the server may round or cap the difficulty you asked for in order to prevent denial-of-service attacks. Keep in mind that some ASIC devices (particularly older ones) may malfunction if you don't set an appropriate difficulty manually. Additionally, the pool also supports BFGminer's --request-diff option to manually set an initial share difficulty. If your mining software supports Stratum over SSL/TLS, you can connect to port 3443 (instead of 3333) to obtain a secure encrypted connection. This makes it impossible for a man-in-the-middle attacker to send malicious spoofed requests to your miner. All our servers support this feature, including the Tor hidden service. Then you connect your miners to that machine on port 3333 with the usual pool worker username and password. For example, if the proxy is running on 192.168.1.123, your miners should connect to stratum+tcp://192.168.1.123:3333 rather than directly to the pool. Would Litecoin mining be profitable for me? Short answer: not if you intend to use GPUs or CPUs, even if you don't pay for electricity. Long answer: it depends on many factors, including your hardware, the cost of electricity and the market price of Litecoin. In practice, nowadays you can only make a profit by using ASIC (application-specific) hardware. Check out our mining profitability calculator. Can I use a Bitcoin ASIC miner to mine Litecoin? No, you need an ASIC designed to mine Litecoin. Litecoin and Bitcoin use two very different hashing algorithms (scrypt and SHA-256d, respectively). Is there a pool fee? No, even the nominal PPS fee was removed when merged mining was introduced. In fact, the “fee” is now negative: the PPS ratio is currently 102%, meaning that miners earn 2% more than with a 0-fee PPS system. What is the PPS ratio? Short answer: all else being equal, the higher the PPS ratio, the more you earn. Long answer: a PPS ratio of 1 (or 100%) corresponds to the expected earnings of a Litecoin solo miner in an ideal world, without taking into account aspects such as orphaned blocks. (In practice, a Litecoin solo miner will always achieve a slightly lower ratio in the long run.) We say “expected” earnings because mining is a stochastic (random) process, and it is therefore impossible to know beforehand exactly how much a miner will earn in a given lapse of time. Thanks to merged mining, a technique that allows multiple cryptocurrencies to be mined simultaneously, it is possible to achieve PPS ratios higher than 100%. This is unrelated to what “profit-switching” pools do, as in merged mining all chains are mined at the same time. For this reason, merged mining does not cause sudden difficulty spikes and does not harm any of the involved networks. How and when does the PPS ratio change? The PPS ratio depends on factors such as the current network difficulty and market price of merged-mined cryptocurrencies. Since these elements can be highly volatile, the ratio can change at any time. Where is my Dogecoin balance? The pool does not keep balances for Dogecoin or any of the other cryptocurrencies that it merge-mines. All accounting is done in litecoins based on the current PPS ratio, which takes everything into consideration. Simply put, this means that instead of receiving separate payments in several cryptocurrencies, you receive more litecoins. Can I use the same worker name and password for more than one physical miner? Yes, but if you use different workers it is easier to track your miners' performance. Your expected rewards will be the same either way. What happens if I reset a worker? A reset resets all of a worker's counters and statistics: shares, blocks, partial rewards and hash rate averages, including the hash rate history displayed in the charts. It does not affect an account's rewards or global statistics. Share difficulty is a number that gives an indication of how difficult it is to find a share. The lower this number, the more shares a miner will find at a given speed, and the lower their value. For this reason, share difficulty does not affect miners' expected earnings. Why does the pool report more shares than my miner? This pool serves variable-difficulty work units, so when you solve a share the pool counts it with multiplicity, according to its difficulty. For example, if you solve a share that is four times as difficult as the baseline share, it gets counted as four shares. The technique of adapting the difficulty to each miner's hash rate allows the pool to measure workers' speed more precisely while keeping bandwidth usage optimal. How does share difficulty influence my earnings? Long answer: a higher/lower share difficulty does not mean you will be earning more/less, because your expected earnings are independent of the share difficulty: they only depend on your hash rate and on the network difficulty. A higher share difficulty can only increase the variance, but not in a significant way. How is the value of a share (a.k.a. the PPS rate) computed? The standard PPS formula is used: BS × R / ND × (SD / 65536), where BS is the block subsidy (currently 25 LTC), R is the PPS ratio (currently 1.02), ND is the network difficulty, and SD is the share difficulty (expressed as a multiple of the minimum share difficulty). Do block finders get extra reward? No. That would go against one of the main goals of the PPS system, which is to minimize variance. It would also make miners who don't find blocks earn less, as the PPS rate would need to be adjusted downwards. We do list recently found blocks and their finders, but only for the sake of transparency. How do idle worker notifications work? You have the option to let the pool monitor your workers and notify you with an email when they go idle. Monitoring can be enabled separately for each of your workers, so if you wish you can have the pool monitor only a subset of your miners. If multiple workers go idle simultaneously (within one minute), you will only receive one email listing all of them. You will not receive further notifications for any given worker until it starts submitting shares again, and in any case not before 15 minutes have elapsed since the last notification. Can I use an exchange address for payouts? While technically possible, we strongly advise against using addresses provided by exchanges or other third-party services. One of the main problems is that you do not fully control these addresses, and in particular if a problem arises you usually have no way to prove that you are the legitimate owner. On the other hand, if you create an address on your computer using any wallet software, you can easily produce a digital signature. If you decide to use a third-party address anyway, we strongly recommend that you do not lock the address. This is because at any point an exchange may stop accepting funds to an address and require you to use a new one (yes, this has happened). Why am I not receiving payouts? The exact conditions for payout are listed on your Payments page. Please note that for your own security, whenever you change your payout address all payouts are suspended for 24 hours. I keep getting the message “Stratum requested work restart”. It is perfectly normal to get this message a few times per minute. It simply means that your miner is switching to a new work unit, because the previous one is no longer valid. Because of the stochastical nature of mining, frequent work updates (which are necessary for efficient merged mining) do not mean that your work goes wasted. I get the message “stale share detected, submitting as user requested”. That is also normal for some mining software. I've just started mining and all my shares are being rejected, what's wrong? Make sure that your miner supports the scrypt algorithm, and that it is configured correctly. My miner shows up as online, but with 0 speed. Is that normal? No, something is probably wrong with your configuration. See the previous question. Why doesn't the hash rate reported by the pool match that reported by my miner? Because of how pooled mining works, the pool has no way of knowing your exact hash rate, so it can only estimate it based on how frequently you submit shares. After you start mining, it takes about 10 minutes for the estimates to become accurate. They will never be very precise, though; even if your miner's hash rate is steady, the pool estimate will keep fluctuating around the actual speed. 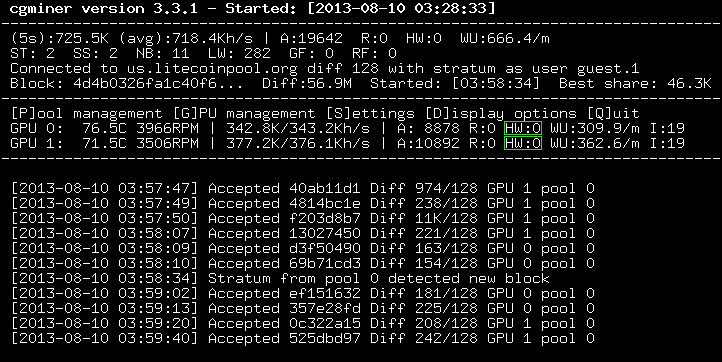 The pool keeps reporting a much lower hash rate than my miner. What's going on? If the estimate displayed on the site remains consistently too low even after a few hours, then chances are that you are experiencing hardware errors. Mining software usually checks every solution generated by your hardware devices, and if one turns out to be incorrect because of hardware errors it (rightfully) doesn't submit it. Since pools can only estimate your hash rate based on how many solutions you submit in a given amount of time, the estimate will be lower than your real raw hashrate. This raw hashrate, which mining software usually displays, is, however, not meaningful if the solutions your card generates are wrong. If using cgminer or one of its derivatives, you need to make sure that all of the HW figures are zero or next-to-zero; if that's not the case, you should review your settings. There are many things that can cause hardware errors, but the most common ones are: a bad or insufficient power supply, overclocking, and faulty hardware. It is worth noting that modern ASIC circuitry tends to deteriorate with time and use, and that when one of the (many) hashing modules inside an ASIC goes bad there is usually no way to fix it. Servers provide each miner with some unique data that the miner must use to find a share. This data needs to be updated every time a new block appears on the Litecoin network, and that's why servers must promptly notify miners when they detect a new block. Every second you keep on mining for the old block is wasted, because that block has already been found. If a new block is found before a submitted share hits the server, the share is marked as “stale”, and yields no reward. Stale shares are caused by latency, which can happen at various levels. The most obvious cause is a high ping time to the server, which however shouldn't affect the stale rate by more than 0.5% in the worst case. I'm getting more than 1% of stale shares, is this normal? No. On our Stratum servers, most miners achieve stale rates well below 1%. Some software-related latency may be unavoidable for some setups, but if your stale rate is above 1% then something probably needs to be fixed. Should I set the --no-submit-stale option in cgminer? No, you should not set that option. If you set it, your rewards may be lower. Stratum is a network protocol for pooled mining, designed as a replacement for the now obsolete “getwork” protocol. It was originally proposed by Marek Palatinus (aka Slush), who also wrote a proxy for miners that could only understand the getwork protocol. Today most mining software supports the Stratum protocol natively, but the Stratum proxy is still useful for reducing network bandwidth usage on large installations. What is the “resume” extension to Stratum? It is an extension to the original Stratum mining protocol, jointly designed by Slush and ckolivas, the maintainer of cgminer. If your mining pool supports the extension and your Internet connection has a hiccup, the server may still accept any shares that your miners found while disconnected, if they reconnect and submit them within a reasonable time. As simple as this may sound, it is actually tricky to implement this feature correctly, because Stratum is not a stateless protocol. Why did my Google Authenticator codes suddenly stop working? It might be because the time on your Google Authenticator app is not synced correctly. To make sure that you have the correct time, go to the main menu on the Google Authenticator app, and select “Settings”, “Time correction for codes”, “Sync now”. Please send an email to support. Make sure you include your username. What Android apps can I use to monitor my workers? You can check your workers with CheckPool, Mining Monitor 4 Litecoinpool or PoolWatch. What iPhone/iPad apps can I use to monitor my workers? You can check your workers with Ethereum Mining Monitor, Miner Stats or Pool Monitor. If you need further assistance, please send an email to support litecoinpool.org. Alternatively, you can contact Pooler in the #litecoinpool channel on Freenode IRC, or ask on the forum. Please note that we will not provide assistance to GPU miners, as it would only be a waste of time and energy for everybody involved.